Newton Stewart RFC welcomed Garnock RFC to sunny Bladnoch Park last Saturday for their second league fixture of the new season. Right from the kick-off the game was fast-paced and heavily in Newton Stewart’s favour with a try in the first minute from scrum half Robbie McCornick setting the tone for the afternoon. Garnock got a try in response just five minutes later, but no conversion on either side left the scores tied at 5-5. Almost ten minutes passed before the next score came in the form of another try for NSRFC, this time for David Sommerville playing at centre. Two minutes later Garnock had a penalty and the score ticked over to 10-8. What followed was a long afternoon for the visiting team as Newton Stewart then took a commanding hold of the game and began to run amock. The remainder of the first half saw two tries for back row Mark McCornick, a further try for Sommerville and two penalty kicks slotted home by standoff Jamie Muir to make the score 33-8 at half time. 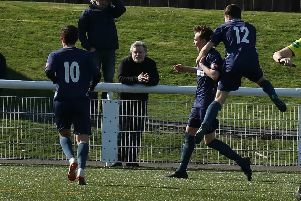 If Garnock had hoped to claw back the score in the second half, their hopes were dashed quickly as Newton Stewart continued their onslaught. Wingers Liam Brawls and Fraser Morton both added their names to the scorers list with tries early in the second half, and Tyrell Wilson at fullback got in on the action too, showing blistering pace to cross the line and bring the score to 52-8. As the game entered the final quarter Robbie McCornick scored another two tries to give himself a hat-trick, but not before his older brother Mark scored his third try of the day to make sure the bragging rights would be shared! Conversions were hard to come by, only four scored out of twelve attempts, but despite this the score finished with Newton Stewart runaway victors at 74-8. There was much to be pleased with from the perspective of the Newton Stewart team - not least the dramatic improvement in both the line out and scrum since last weekend. There were still a few handling errors for NSRFC which could have been avoided, and would have resulted in further tries if the ball had gone to hand. On the whole however the team played with great confidence and fluidity which was both entertaining and encouraging to watch. Man of the match this week was Tyrell Wilson who has impressed in recent weeks with his confident running with ball in hand and good decision making under pressure. It must be said however, that the whole team deserves credit this week for an outstanding performance. The bar is now set high for the games to come. Newton Stewart RFC have an away game at Kilmarnock RFC on Saturday 26th September. The next home game will be on Saturday 3rd October again Lenzie RFC with an earlier kick-off time of 1pm.